How and Where to Buy Domperidone? CanadianPharmacyWorld.com offers Domperidone (Generic Motilium) from Canada, UK and Turkey at huge discounts. A valid RX is required. For more information and further details on How To Order, please call our Customer Service at 1866-485-7979. Are there Alternative Names for Domperidone (Generic Motilium)? The generic Domperidone comes from UK and Canada and is manufactured by different manufacturers. What Dosages and Forms is Domperidone available in? Domperidone is available in the strength of 10mg tablets. What is Domperidone used for? Domperidone (Generic Motilium) is used to treat gastroparesis. It is used to treat slowed movement in the gastrointestinal tract associated with diabetes and gastritis. Domperidone belongs to the group of medications called dopamine antagonists. It improves symptoms of nausea, vomiting, bloating, and feeling of fullness. This medication works by helping the stomach to empty more quickly and to reduce nausea. The usual dose for the treatment is one to two tablets three to four times a day before meals. What are the Possible Side Effects of Domperidone? Are there any Precautions or Drug Interactions for Domperidone? You should not take Motilium if you are allergic to Domperidone or if you have any other allergies. Before you start taking Domperidone, speak to your doctor. This medication should not be used during pregnancy or breastfeeding unless the benefits to the mother outweight the risks of unborn baby. Motilium is approved to treat certain gastric disorders. It should not be used to enhance breast milk production in lactating women. There may be interaction between Domperidone and other medications such alfuzosin, amantadine, amiodarone, tacrolimus, tamoxifen, tetracycline, vardenafil, venlafaxine, etc. 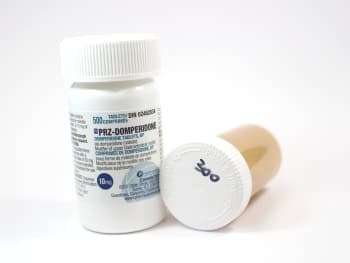 Domperidone should be stored in a closed container at room temperature, away from heat, moisture and direct light. Do not keep expired medication or medication that is no longer needed. Keep out of reach of children.